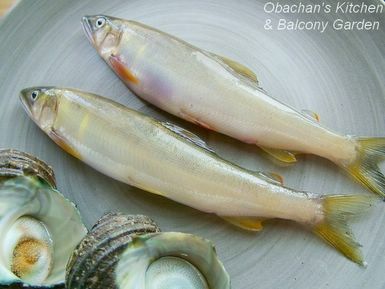 Anyway, to me sweetfish is one of the most beautiful fish among those we see in Japan. They say ugly fish taste good, but I think this sweetfish is the kind that looks elegant AND tastes wonderful. One of my childhood dreams was fishing sweetfish in the river (inspired by a manga about a boy who is a fishing genius), which I haven’t achieved yet. So when I found these fish on the shelf at an amazingly low price, I thought it was a perfect opportunity to try the idea of "shichirin night," (inspired by the post by Jason of Pursuing My Passions) with my favorite fish. In a nutshell, it is an attempt to grill food (on the balcony) on a small table-top grill called shichirin. In order to add a little variety to the food to be grilled, I grabbed a pack of these turban shells, which was also sitting on the shelf near the sweetfish. I must confess that my attempt of shichirin night did not work out. Let's blame the charcoals. I didn’t bother to buy good charcoals, and when tried with those I had at home, it took forever to light them when I heated them on the gas stove in the kitchen. Even when I thought they were ready, they didn't stay hot for long and I had to come back to the kitchen to re-heat them. Finally I gave up on using shichirin after going back and forth between the balcony and kitchen several times. 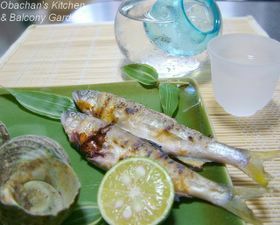 These sweet fish were grilled in my electric fish griller and the turban shells on the gas stove. And both tasted good! What a shame -- they must have tasted awesome if charbroiled! I am an American, and moved to Sasebo, Japan in January of this year. I stumbled across your blog, and have enjoyed your posts so much! I check every day to see what beautiful things you have in store for your readers. Thank you so much for your amazing food and your charming posts. The sweetfish look so beautiful! Thank you for identifying the turban shells for me. I've seen lots of shellfish here in Japan that I don't recognize, but it's delicious! that is one cool item you bought from the 100-yen store! I'm gonna look out for it! I love sazaes too! And I recently discovered that the small "shell-cover" makes a perfect chopsticks rest. Don't throw them away the next time! Oh, I love the little Sake cooler! I too had trouble getting the charcoal going, so I started then on the stove like you did but I put them in the shichirin and used a hair dryer with an extension cord to blast them to life. You're right - the fish are beautiful, so sleek ... and that sake cooler is a great idea ... back in the '60s, we had a wine decanter - similar idea, since my then-husband liked his drinks cold-enough-to-feeze-your-toes. Hi! The sake cooler is a cute thing, isn’t it? I have to admit that the ice cubes in the pocket melt pretty quickly and you need to repeat emptying the water from the pocket and adding new ice cubes. 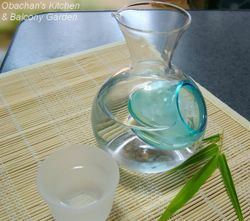 Honestly, it must be more practical to stick a sake bottle in a bunch of ice cubes in a bigger container. But I guess this is something to enjoy the cute and interesting idea, so I’m happy that I bought it. Yeah, when I wrote that part, I was thinking about monkfish, too. Have you tried monkfish liver (ankimo)? It’s a real feast. You’re right. The fish definitely tasted better after they were grilled. Oh, I didn’t know that there was something similar for wine. How interesting! Somehow it makes me happy to find out that people in different places have developed same kind of tools, following the same ideas, but with diversity. And I like my wine cold, too (though I read somewhere that some wines should be served at room temperature). Hi there! Ever tried disposable BBQ kits? Works well if have very little to grill. Or try Match & Light type of charcoal (I get these from BBQ specialty stores) - burns like a dream. Good luck. Your fish looks beautiful and sounds yummy. The 100yen sake jar retails in Singapore for a lot more. Wow! Thanks for the info. I’ll see if I can find them at the Sports Authority. Hi! Nice to hear from you! So you have this kind of sake jars over there? I wonder how popular they are. awesome!the sweeetfish looks since luminiscent and beautiful...a bit like an opal or even rainbowfish. I actually have a puchi version of the sake cooler XDD (from re-ment). Hello Obachan! I love the water container!!! 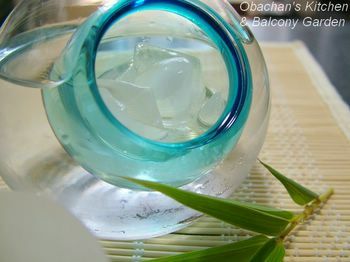 :) I've been looking for that everywhere here in Manila... Too bad there's none..
Obachan - isn't that fantastic that you can get that beautiful sake cooler for 100 yen :) the fish is incredibly beautiful (shining! ), I miss ayu so much. Yeah, I was very lucky that I found this sake cooler at the nearest Daiso, because other Daiso shops in town didn't have anything like this.